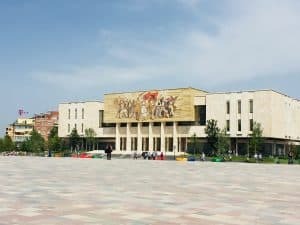 Before arriving in Tirana, I have to confess I knew very little about the city, other than that it was the capital of a former communist country that, until relatively recently, rarely, if ever, featured on a “must-see” list of places to visit. But it’s increasingly appearing in travel blogs as a place to consider, and given how near Albania is (the country is snuggled in between mainland Greece and Montenegro so flights are of a similar duration), I thought it was time to see the city first-hand. I had three days in Tirana which is probably enough time to take in the main sights. I managed to pack a lot in, including a walking tour of the city, a whistle-stop visit to some superb museums and a trip up Dajti Mountain, not to mention a one day trip out to the small Ottoman town of Berat, which is a few hours by road each way from Tirana. This gave me a short, but good, insight into how varied a country Albania is. 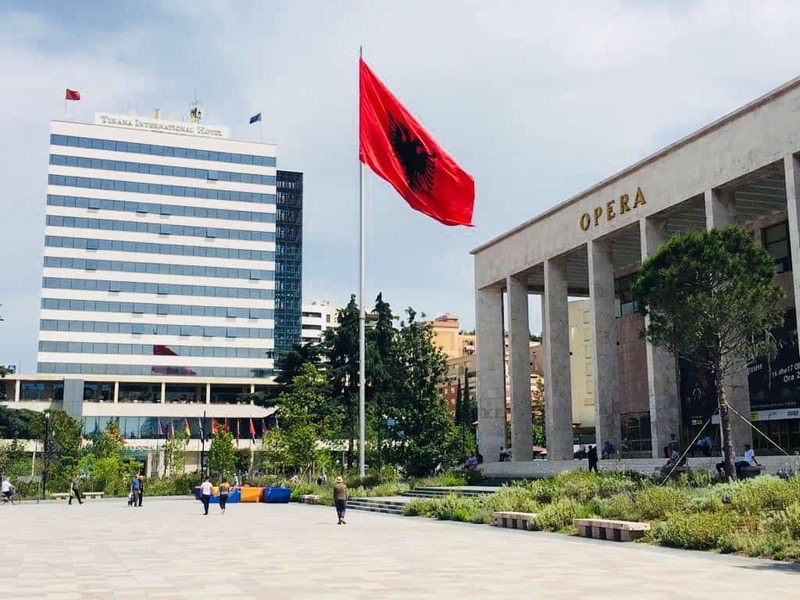 Tirana’s main focal point, Skanderbeg Square is the best place to start; this offers a fascinating snapshot of the country’s past and is where the different eras converge, throwing up buildings from the Ottoman era, Italy’s brief occupation of the country, the communist post-war period, as well as the more modern additions to the skyline. It is almost like the square is a visual display of the country’s past and present. It’s a huge open area, spanning some 40,000 square metres (by way of comparison, Trafalgar Square in London is 12,000 square metres). It’s large proportions and wide sweeping open space lend it a real communist feel (although it had in fact been constructed before the communists came to power). But if you walk around its perimeter, you can glimpse traces of the country’s varied past. On one corner is the 18th century Et’Hem Bey Mosque and the 19th century Clock Tower, constructed under the 500-year Ottoman rule. These are both beautiful structures, but the mosque is particularly impressive, with its sleek white minaret. 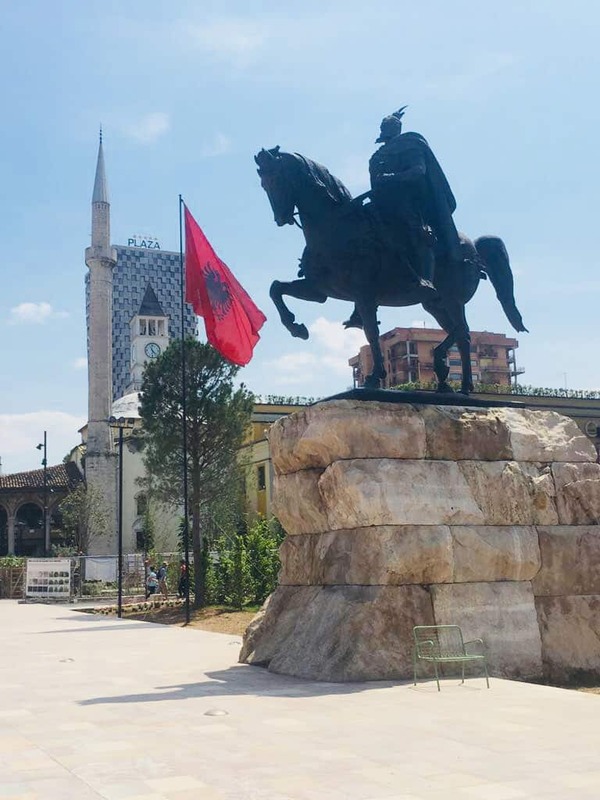 Nearby is an eye-catching monument of Skanderbeg towering over the square astride his horse. It’s impossible to visit Albania and not notice the large number of monuments in honour of the country’s national hero. He’s revered for his command of the resistance movement against the Ottomans in the 15th century and here in the square he looks down majestically from the top of his horse. Right across the square are the National Bank, the town hall and Dajti hotel building; these notable landmarks, as well as the wide boulevards that frame the square are the work of Italian architects who exerted influence on the city when the country was occupied by the Italian fascists from the late 1930s. And then there are the communist era buildings which offer a stark reminder of the totalitarian regime which emerged towards the end of World War II, with Enver Hoxha as the new Prime Minister in charge of rebuilding the beleaguered country – there is the Opera House that takes up an entire side of the square, with the Albanian double headed eagle flag flying outside, and the National Historical Museum on another. There had once been another communist relic – a statue of Enver Hoxha – but this was pulled down during demonstrations in 1991 during the move towards democracy. 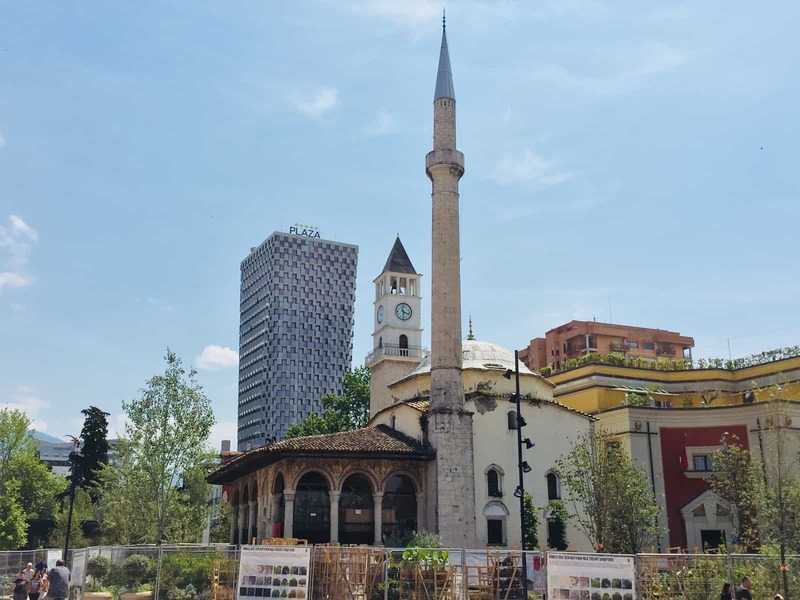 This visual insight into Albanian history can be complemented with a visit to some of the history museums in Tirana. We visited two, both of which I would wholeheartedly recommend. 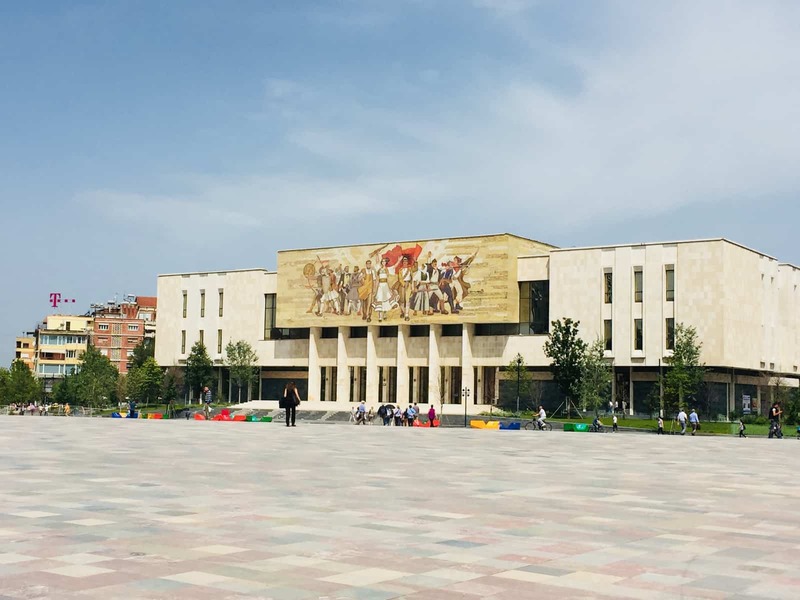 The National Historical Museum covers the gamut of Albanian history, from prehistorical times, through the medieval period to the Ottoman rule, from the early years of independence through the Second World War and finally the communist era. You can also learn more about the country’s independence that it gained in 1912 (declared in the southern coastal town of Vlore and that you can read about in my earlier post). The museum takes up several floors which are easy to navigate and offers an impressive array of historical artefacts spanning the different eras. For the most part, there are English translations to aid your understanding. This is literally a five minute walk south from Skanderbeg Square. It is, as its name suggests, contained in an old communist bunker, but it is not, as the name might also suggest, an art gallery. It is a history museum charting the brutality of the communist regime under Hoxha and was both fascinating and horrifying in equal measure. No visitor should miss this on their trip to Tirana. You enter the museum from street level and walk underground into what was once the bunker for the Ministry of Internal Affairs. This was one of over 170,000 bunkers built across Albania from the 1970s onwards, and that reflected the increasing paranoia of the communist leaders. This one consists of 24 rooms, designed to serve as both a work place and residential home, in the event of an attack on the capital. It was, however, never used, as both Enver Hoxha and his successor as Prime Minister, Mehmet Shehu, died before it was completed. 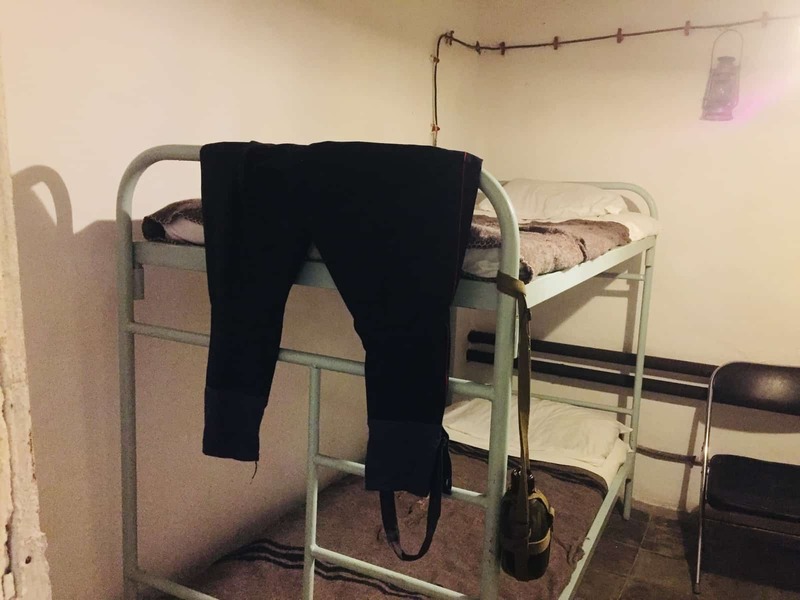 You see the rooms that were kitted out for use as you move through the museum – these adjoin the long, narrow, and dingy corridors that lead you around the bunker. There is a boardroom, an office and a bedroom. 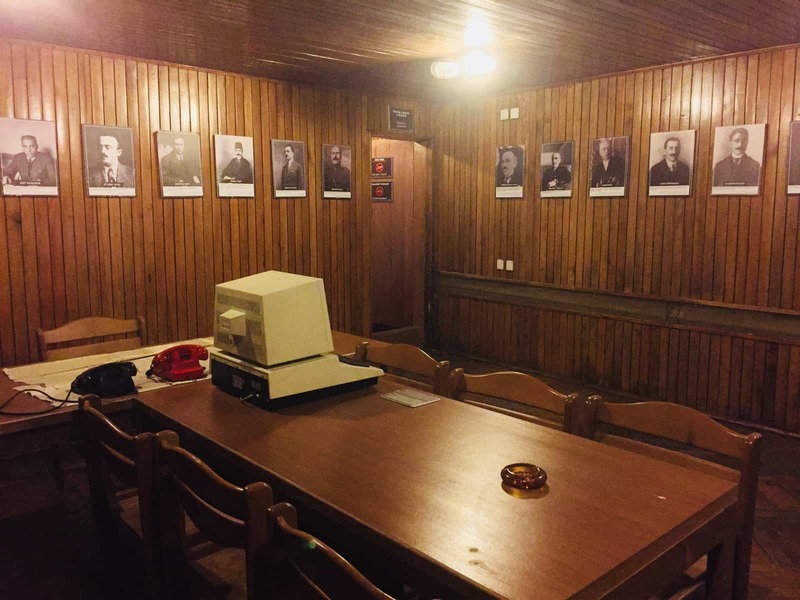 However, for me, the more interesting part of the museum is the story it tells of life under the communists for ordinary Albanian people. The first section of rooms focus more on the changing face of the Albanian police force, post the Italian invasion, including the formation of the “Sigurimi”, a secret police force tasked with protecting the country and which played a crucial role in facilitating some of the atrocities you read about in the excellent and informative wall displays. These include the persecution, arrest and murder of thousands of people accused of various crimes against the state (you are told that in the 45 years from 1944, over 6,000 people were executed and this is on top of the huge numbers who died as a result of poor conditions in the 90 labour camps that were set up). 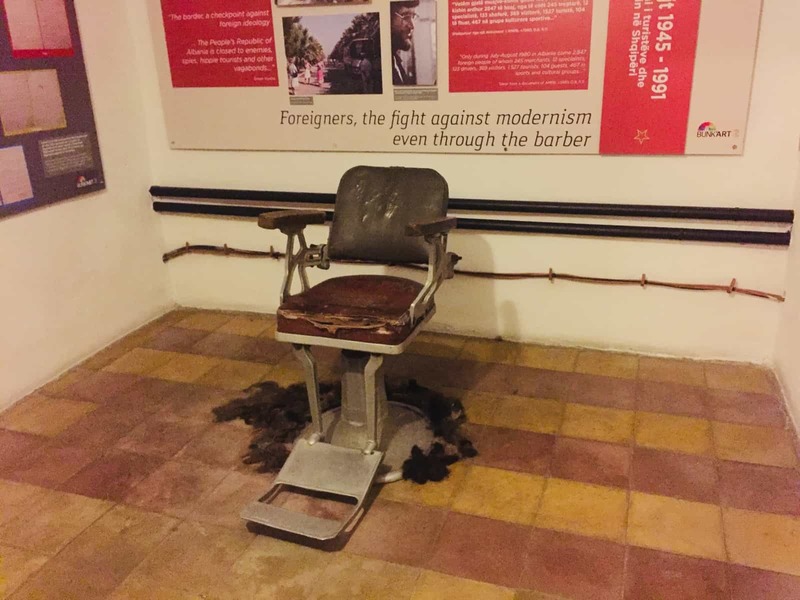 Interspersed alongside the often heart-wrenching stories are visual reminders of the atrocities and the rule of law that people had to live under: a prisoner’s cell, a barber’s chair to illustrate the dictat that anyone arriving into the country with long hair needed to be shorn, and various telecommunications equipment used for spying. There is also a list displayed on the wall of over 30 different forms of torture used on prisoners, all of which – in different measures – send shivers down your spine. Most moving, however, were the rooms where there were lists of names of all those who perished printed onto to banners that were hanging from the ceiling. You can’t help but appreciate the vast numbers when they are – literally – swinging in your face like this. 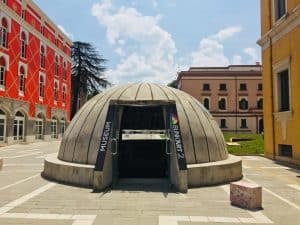 What I read and saw in this museum left me saddened, but much more enlightened about life in Albania in the second half of the twentieth century. 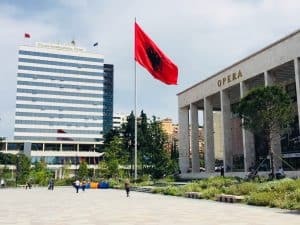 However, my visit to Tirana in the twenty-first century showed me that the country has entered an exciting new chapter; the city has a real buzz and the signs of regeneration that you see everywhere indicates a positive future. Whilst I only had a short time here, I saw enough to know that I definitely want to go back. For further ideas of things to do and see in Tirana, see my forthcoming post. Tirana sounds like a very interesting place to visit!